Living in the US, I see signs of media piracy all the time. I have numerous friends who are unrepentant music/movie/TV/book pirates. And while I buy a surprising quantity of my media, I also pirate that which I cannot get due to international rights laws or due to foolish business decisions on behalf of media companies. (Dear HBO, some of us True Blood fans would actually pay for your content if you would just make it available without requiring us to own a TV/cable subscription. ktxby.) Whenever I travel to Europe, my friends complain incessantly about how they cannot get access to American media content without pirating it. Yet, whenever I hear people around me talk about their practices of media piracy, it always comes with a coating of guilt layered on the top like molasses. Even my unrepentant friends frame their practices in terms of how they refuse to feel guilty because of XYZ corrupt institution. Guilt prevails as the dominant Western discourse to respond to when engaged in acts of piracy. Not in India. I was absolutely enthralled with how the discourse around piracy in India was radically different than anything I had seen elsewhere. In India, piracy is either 1) a point of pride; or 2) a practical response to an illogical system. There is no guilt, no shame. I loved hearing people talk about mastering different techniques for pirating media, software, and even infrastructural needs (like water, electricity, even sewage…) There was a machismo involved in showing off the ability to pirate. To pay was to be cheated, which was decidedly un-masculine. Of course, getting caught is also part of the whole system, but the next move is not to feel guilty; it is to bribe the person who catches you. Ironically, people will often pay more to bribe inspectors than it would’ve cost them to pay for the service/item in the first place. Again, we’re back to pride/masculinity. Pirating was an honorable thing to do; not pirating is to be cheated. Money is certainly an issue for many Indians, but a lack of resources doesn’t fully explain the practices of piracy. Another factor at work has to do with the role of conspicuous consumption in India. It’s perfectly reasonable for a well-to-do Indian to spend an obscene amount of money on an expensive car, a fancy electronic item, or brand name clothing. But that’s different, because those items are to be shown off as a symbol of status. No one shows off the fact that they bought a legal copy of software or a legal version of the latest Bollywood flick. Showing off the fact that you paid full price for something that could be obtained for free would make you look foolish, not important. Pirating is a completely naturalized practice. The issue of piracy is certainly complex and I’m being overly simplistic in what I’m offering (see: Adrian John’s “Piracy” for a more proper treatment of piracy). But I can’t help but think about the significant cultural differences between the US and India whenever I hear Americans talk about the “problem” of piracy. Piracy means such radically different things to Americans and Indians and, more importantly, the guilt that makes many Americans comply with anti-piracy regulations is completely ineffective in India. I really wonder how these kinds of issues are going to play out… Will corporations find new ways of forcing Indians comply? Will Americans’ attitude towards piracy become less guilt-ridden? What will all of this mean for software, media, and even infrastructural elements? One thing’s for sure… social norms will still dominate any legal or technical regulatory intervention. We’re a diverse bunch here at the SMC, but what we have in common is that we are nerds who read a lot. I went on office patrol to find out what my compatriots have selected as their August summer reading. Danah is also reading The Wind-Up Girl by Paolo Bacigalupi, a critically-acclaimed steampunk/dystopia. She and I share a love for YA, sci-fi, and YA sci-fi. Me: Is it written from a male perspective? Heather: They say in the beginning of the book that it’s aimed solely at men. The Naked City: The Death and Life of Authentic Urban Places, by Sharon Zukin. Some advocates of “real name” policies argue that pseudonymity is far too easy to abuse. They suggest that “real name” policies help reduce spamming and trolling. This might be true, however, you can still get a fair amount of troll-like behavior and hateful discourse in “real name” sites. Just sit on these Facebook searches for a few minutes and you will see the things people are willing to say using their real names. But what about anonymity? Do anonymous websites get run over by spammers and trolls until they collapse? This refers to the identity metadata of a participant that a system displays when he or she interacts with others. 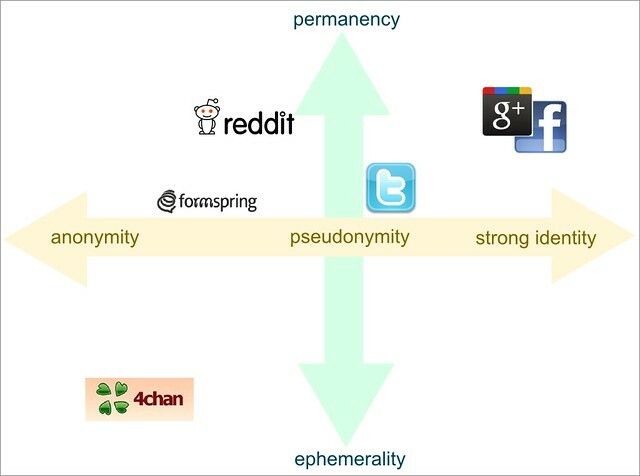 Identity representation ranges from strong identity, such as Google+ and Facebook’s “real name” policies, to pseudonymity, such as Twitter @handles, to anonymity, such as 4chan’s complete lack of user names. It is important to note that the information a system collects or requires from the user is not necessarily the same as the one it displays to its peers. For example, most websites collect (at least temporarily) the IP addresses of their users but few show them to others (Wikipedia does this when not logged in). Even anonymous websites like 4chan bans users based on their IP addresses. This axis refers to the longevity and availability of content associated with a specific person in the system. These strategies range from permanent archival, such as Google’s everlasting logs, to temporary archival, such as Twitter’s limited history, to ephemerality, such as 4chan’s five-minute post lifespan (from our paper). Design choices for social websites. Of course, even these two axis are a simplification of the design choices available. Many websites use clever hybrid models, for example, Formspring lets people link their accounts with their “real names” (using Facebook) and post content pseudonymously (with their Formspring user name) and anonymously (without user names at all). Similarly, Canvas uses a unique hybrid model that combines some of the options described above. I mentioned before that even “real name” websites have a fair amount of inappropriate and offensive content. Pseudonymous websites are not strangers to that either, in fact, it might well be possible that they are even more likely to host undesirable content. However, pseudonymous websites can also be highly prosocial. Two of my favorite online communities, StackOverflow and Reddit, often display astonishing examples of altruistic and pro-social behavior. But what about completely anonymous communities? Do they eventually get run over by spammers and trolls until they eventually die? The answer is not exactly. 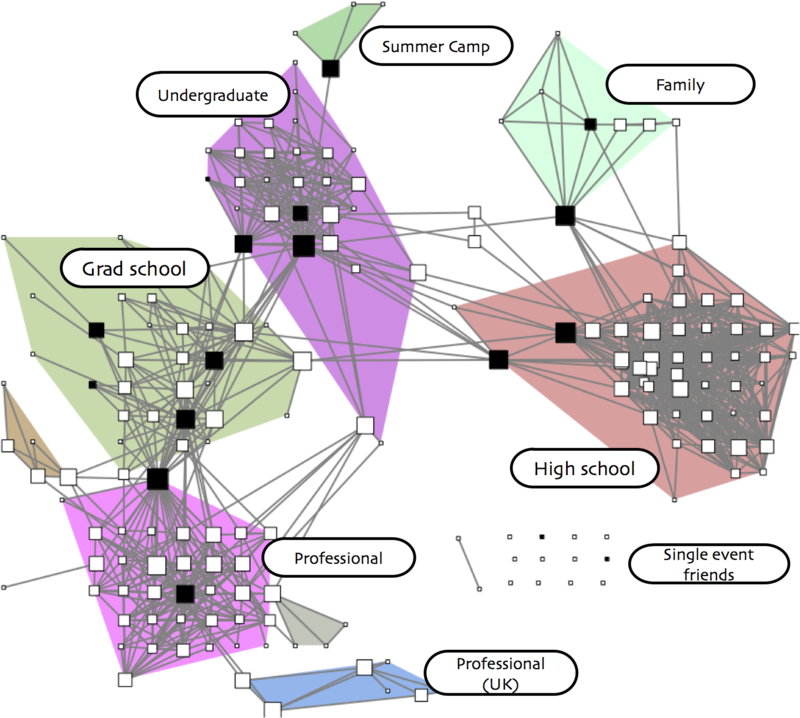 In our paper, we analyzed a specific community with anonymous and ephemeral content: 4chan. Say what you will about 4chan, but the website has already survived Friendster, MySpace and Digg (OK, these sites are not gone, but you know what I mean). Despite its archaic visual design and its offensive and extremely inappropriate content, 4chan is a thriving community with more than 7 million users and with about 400 thousand posts per day in only one of its boards, /b/. OK, 4chan has been alive for seven years and it is still thriving, but what about its content? The media coverage of 4chan has portrayed the site as “the Internet hate machine“. But the reality is much more nuanced than that. First, 4chan has several discussion boards. Some are more offensive than others, but the one that grabs the headlines is the random board /b/ because of its “rowdiness and lawlessness“, as 4chan’s creator put it. Indeed, a lot of /b/’s content is pornographic and offensive, sometimes it resembles public bathroom graffiti or even dadaist art, as Amy Bruckman once said to us. The media has placed a lot of attention on the cases of off-line harassment that originated in /b/. 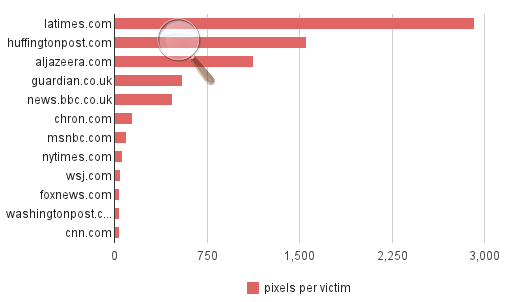 However, our data showed that only 7% of the posts intend to agitate off-line action. The rest are mainly people sharing funny image macros, themed discussion, links, personal stories, sharing the grievances of everyday life or even asking for advice. Most of the agitation to action fails to gain any traction, they get shut with responses such as “/b/ is not your personal army”. Participants take nothing seriously and are happy to make fun of everything (except violence against cats or puppies). Understanding 4chan is also complicated. Uninitiated users might take the posts at face value which does not always capture their real intent or meaning. For example, participants often call each other “/b/tards” or some version of the word “fag” (e.g., “newfag” to refer to new users, “eurofag” for Europeans). These terms are clearly offensive, but in the context of 4chan words and insults are often re-interpreted and co-opted. Common words used on 4chan's /b/. 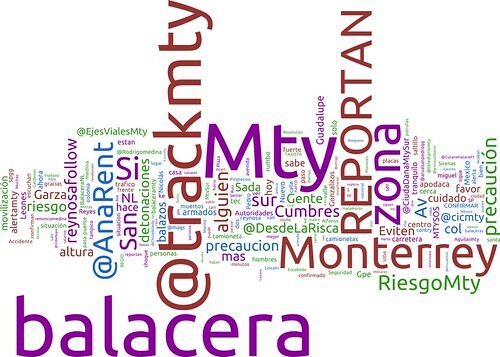 Word cloud of five million posts. 4chan’s /b/ is probably not the strongest example to argue for the value of anonymity.Protecting activists, victims of abuse or whistleblowers, to name a few, are much stronger reasons for anonymity. But what I am saying here is that anonymity and ephemerality, even at it its worst, do not necessarily lead to a community’s collapse. And in fact, 4chan’s long record as the birthplace of a lot of Internet culture and memes might suggest anonymity is conducive to social creativity. David Cameron has vowed to do ‘whatever it takes‘ to restore order after the riots: this seems to include blocking access to social networking sites. We’ve heard a great deal about the use of social media for rioters to organize, as well as boasting about their ill-gotten gains – posting images of stolen goods and inciting others to do likewise. Exactly how much incitement to riot was occurring in these spaces is unclear. Mobiles, too, are implicated, as BlackBerry’s BBM encrypted messaging service was purportedly used by some to coordinate looting. Is it desirable, or even possible, to shut down access to social and mobile media networks during times of crisis? Exactly what does Cameron have in mind? To find examples of technical feasibility, we have multiple examples in the Middle East, where access to the internet has been cut off several times during the events of the Arab Spring. 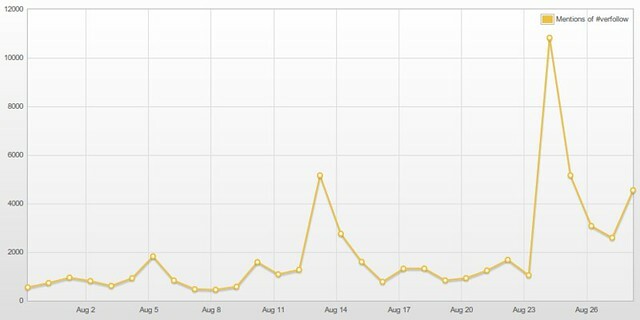 Egypt, Libya and Syria have all severed net traffic during protests, and with considerable effectiveness. It’s not the kind of list we’d expect a mature democracy like England to want to join. If Cameron is thinking about something more individualized, where only some people are restricted, this will still land him with some very sticky civil liberties issues. But is shutting down networks – in part or whole – even a good idea? To answer that seriously, we need to look at the whole range of activities that occur in social media spaces like Twitter and Facebook. Social media spaces are complex: they perform critical roles of sharing information, news gathering and emotional support, while also being conduits for rumor and abuse. If we take the case of the London riots, we have seen extraordinary acts of pro-active social engagement: from #riotcleanup which rallied people to clean up the streets, to various forms of citizen journalism that have made substantive contributions to media coverage (for example, see Leon Piers‘ @BristolRiots on Twitter or Casey Rain’s Tumblr, Birmingham Riots 2011). Malaysian student Asraf Haziq, who was attacked at knifepoint by rioters, became the focus of a social media campaign to raise money for his recovery. These significant social responses, organized and distributed via Twitter, Facebook and Tumblr, would cease to function if networks were restricted or shut down. We can consider the people on social media sites who engage in community rebuilding as ‘first responders’: before government programs respond or insurance claims can be filed, people are organizing via a range of space (some online, some not) to organize and assist those who have been most affected by a disaster or a riot. We saw similar actions in response to the devastating Queensland floods: first responders used Twitter to share information and assist flood-affected communities. If governments restrict or paralyze these networks, they also bring to a halt precisely the kinds of pro-social organizing that communities use to fill the gaps long before many official institutions can respond effectively. If the riots remind us that cities are always vulnerable spaces of politics, negotiation and rupture, Cameron’s realpolitik underscores that social media networks are also fragile. They are susceptible to challenges, both technological and political: including hackers, accidental system overloads, and politicians who wish to censor, restrict or block them, be they in democracies or dictatorships.